Now that I have packed away my ghosts and goblins for another year, I've found myself in that awkward seasonal decor rut (you know the one). It's that time of year where big box stores have an identity crisis, unable to decide whether or not they're committing to fall or Christmas decor. Acorns are mixed with holly, and somehow I manage to escape those aisles confused, feeling a little bah humbug and covered in glitter. This year I decided to change up my approach to fall decor (my favorite season of all). Being that I live in a one bedroom apartment, there was no need for oversized decor to pollute my abode. So I took a different spin on things. 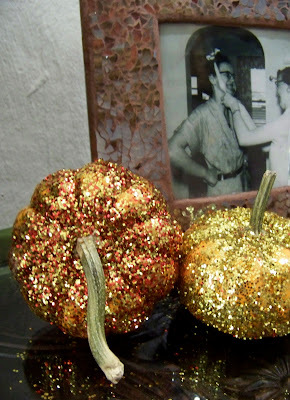 This year I settled on making glitter pumpkins. 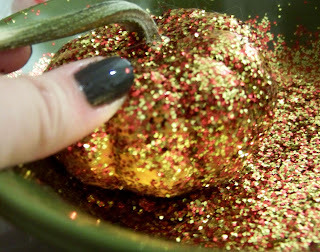 To begin, I grabbed some small pumpkins in the produce aisle at my local grocery store and swung by a craft store to pick up seasonal-colored glitter (I can't recall if and when I have purchased glitter previously...it had to have been during the puff paint days of yesteryear). I was prepped. Glitter in assorted fall colors. I used the stuff I used to use in elementary school. You can use a finer grade, but I wasn't really in to making couture pumpkins. Clean the pumpkins so they are free of debris. Brush rubber cement on the pumpkins and sprinkle glitter to complete your look. Another tip to enhance your pumkins is to mix different colors of glitter together to add dimension to your grouping (I mixed red and yellow since I could not find orange glitter). Let dry overnight. These sparkly gems are rather versatile in how you can use them to add some spice to your home decor. Let them stand alone or in a group. Place them in a bowl on the counter or as a centerpiece, or group them around candles or picture frames. 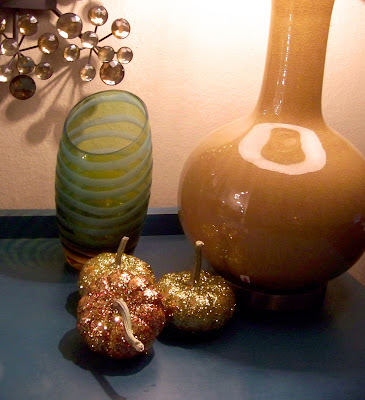 As an accent piece or a gift, I've found adding a little glitter to your home is a thrifty and sparkly way to celebrate the holidays.